The publication of The land’s meaning, Randolph Stow’s new and selected poems, is by any measure a significant event in Australian letters. 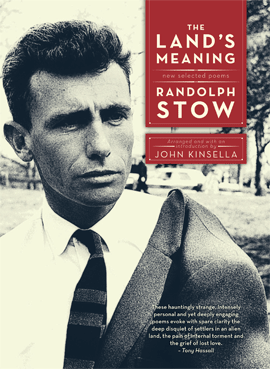 Stow’s poems have long been out of print, and this new collection, edited and introduced by John Kinsella, is a timely and substantial reconsideration of one of our greatest lyric poets. It’s a generous selection – Kinsella has included two libretti Stow wrote for the English composer Sir Peter Maxwell Davies, and some short and apt selections of Stow’s prose – but it is still far from a collected work. Stow was a ruthless editor of his own work, and Kinsella was permitted to republish only those poems that Stow himself considered fit. Like Kinsella, I first encountered Stow in Craig’s anthology as a young poet. Like him, I was profoundly struck by Stow’s statement. And also like Kinsella, ‘I felt a kinship.’ This kinship is now so old, so bound up with my own writerly evolution, that it’s difficult to excavate: these poems speak to me with the force of my own history. As Kinsella’s very personal and often acute introduction demonstrates, I’m not alone in feeling that Stow was writing those ‘private letters’ to me. Audiences, of course, are multiple and unexpected. One never knows where the message will wash up, what meanings will ripple out from the motion of the poem, ‘under way’ in all its different voyages. As Kinsella says, ‘his writing itself did its own things, and forever remains the zone of those who read it’. This is true of all writing: but it seems particularly apt of Stow, whose starkly painful lyricism seems to carve out and inhabit a space of pure metaphor that has the capacity to strike deeply into the silences of others. My relationship with Stow’s poetry, as a first-generation English migrant, is very different from Kinsella’s, as a fellow West Australian poet raised in the same country that nurtured and haunted Stow. In a sense, I approached him from an opposite sensibility. For Kinsella, this poetry is firstly deeply located in place and time, a particular environment and history that is, in grievous ways, estranged from itself. I recognised the estrangement first, the quality of a language that is not and cannot be native to itself. 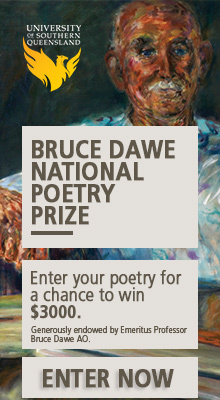 In all Stow’s work, and especially in his poems, the problem of writing English in Australia is at crisis point. Colonising a territory begins with the language, with the act of naming and renaming, and Stow is acutely aware – ironically and tragically aware – of the wounds, linguistic and otherwise, that come in the wake of this colonisation. This is at the core of the post-colonial consciousness of his work, and is perhaps the root of his long exile. It’s no great mystery to me why he lived most of his adult life in East Anglia, as far from his birth town of Geraldton as it is possible to get. David Malouf said in an interview with Paul Kavanagh: ‘One of the most interesting things about Australia and the problem in Australia is that the language we use has not developed out of a long cultural history in this particular place, as is true of Italy or England. What we had was a highly developed language and names for everything, and a reality in front of us that did not fit.’ Even as the son of an old colonial family, Stow knew that the language he possessed ‘did not fit’. In one of his earliest poems, echoing Whitman, he says: ‘Do I idealise? / Then I idealise.’ (‘Seashells and Sandalwood’). Equally, as a rural child, he understood and could not ignore ‘the underlying cruelty of being’ (‘Country Children’). From the beginning, Stow has a Rimbaudian awareness of the abyss between language and the realities it purportedly encompasses, and saw poetry as a means – an impossible means – of reconciling the irreconcilable. As with Rimbaud, what saves Stow’s work from evaporating in a fluffy stratosphere of poeticisms is his realism: his idealising imagination exists side by side, is in fact deeply entwined with, a strict fidelity to the realities he inhabits. Reconciliation is both possible and impossible, and the poem is the articulation of this paradox. Perhaps this is the case for all poets, who demand of language something that it cannot deliver, and that the best poets know cannot be delivered. Stow has been accused of nostalgia, but that is unfair: he always knew the Eden he longed for had never existed. This, of course, never made it any less true. with tongues, with words. Their names are sweet in the mouth. Yet this masculinity is as fractured, opaque and ambiguous as everything else in Stow’s poems. Stow was homosexual, a poet who grew out of a society at best deeply suspicious of poetry and ambiguous sexuality. Kinsella says that Stow is neither ‘a homosexual nor a heterosexual writer’: one suspects that Stow would have found such labelling both impertinent and beside the point. He is, primarily, a poet of love. At the same time, one can’t but speculate that a heterosexual writer of Stow’s sensibility would not have had the same imperative to privacy, the same recourse to the dramatic mask. cleaves, O love, as your cloven city cleaves you. intending harm (you had done me such springlike harm). This masking is equally manifest in his dramatic works, the extraodinary libretti for Eight Songs for a Mad King and Miss Donnithorne’s Maggot. Yet Stow was a poet who understood from the beginning the inherent theatricality of language. The mask exists in all his poems, in the lyric diction that that is so unfit for some of the realities he encounters – the brutalities of Australian settlement, the barbarities of the Burma Railway – and which yet through its very unfitness, inscribes them in the reader’s imagination. There’s much more to write about this book: the influences of Buddhism, Taosim, French Symbolism, Modernism, anthropology; the complexities of his responses to Australian colonisation; the sense of voyaging that exists throughout his poems. Stow’s poetry has many facets, which reward multiple readings. The land’s meaning is an excellent introduction for those unfamiliar with his work, a welcome return for those who already know it, and belongs on the bookshelf of anyone interested in poetry. There is no other poet quite like him. A pleasure to read: you, him. Thanks, Alison. Ditto the above, Ms. Croggon (Apologies if this address is overly formal, but I live in faraway Lismore in the Rainbow Region (northern NSW) and don’t know you personally). Again another informative post on Overland (even though at times some of my posts are critically tetchy). I’ve read two posts in the last ten minutes and my world has been and is expediently expanded. I intend buying and reading this collection of poems. As I read your post, I kept wondering about Stow’s sexuality and how it related/relates to his poetry and then you discussed it. Thank you. I wonder if the ‘ambiguity’ of Stow’s language and the representation of gender, sexuality and conditions of life like being in love, in his poetry were/are subject to historical conditions. Possibly the lack of the first person ‘I’ was a personal choice with the full awareness of his sexuality and the difficulties of living it. Possibly it was a way of surviving more homophobic times, that is, Stow was a historical subject born and living during particular historical conditions and developed strategies, like many of us including myself, to simply survive. Possibly it was other considerations that neither of us has thought about.